To consumers searching for ways to make commerce faster, safer, and more convenient, the benefits of using a digital wallet seem to be undisputed. Encrypted, tokenized transactions keep card data secure. Replacing physical wallets, cards, and cash with an invisible payment makes commerce easier than ever. Instant access to discounts, digital offers, and a customized shopping experience all increase the value of a transaction for the consumer. So why, then, isn't everyone using one? Merchants might be to blame for not playing a bigger role in educating customers. The benefits of digital wallets for retailers match, or even exceed, the benefits for the consumer. Beyond speedy transactions and shorter lines, digital wallets can serve as a connector between merchant and consumer by providing a channel to engage with customers in a more meaningful way. But before this is possible, merchants must play an important role to drive digital wallet adoption. After all, merchants are the face of the payment, on the front line of the transaction, and they must be informed and educated on the technology for adoption to proliferate. Lack of education of digital wallet technology is a leading cause of low usage. Forrester reports that 69% of self-reported digital wallet users say they prefer using digital wallets, while just 4% of nonusers express interest in them—those who try digital wallets like them, but those who haven’t tried them don’t care to. The burden of education often lies with the merchants, whose staff and retail representatives must be properly trained on using digital payments. Clerks, cashiers, and retail workers must be incentivized to be advocates of digital payment technology. Use of physical signage, social media communication, and email newsletters can reinforce a digital payment campaign. Letting your customers know how a digital wallet works and which types are accepted at your location is a good first step. Educating your consumers will raise awareness, but won’t necessarily drive adoption. In order to do this, merchants must offer value beyond the transaction. Convenient payments aren’t always enough. Reward points, discounts at purchase, and order-ahead capabilities are big selling points for consumer adoption. Fraud and data breaches have been the biggest obstacles to ubiquitous digital wallet adoption. In fact, security concerns are cited by respondents as the primary inhibitor to mobile wallet adoption, according to a study conducted by 451 Research. Consumers are wary, as they should be. Encouraging users to trust an app or digital wallet with personal identifying information can be a big hurdle, especially at outdoor payment terminals like gas stations. The best way to demonstrate the security of a platform is through showing, not telling. Tailor your messaging to target younger age groups who are more likely to trust the new technology. According to 451 Research, people aged 25-34 have the most favorable security perception of mobile payments relative to credit cards (52% believe mobile payments to be more secure than credit cards). From age 35 onward, according to the study, the perception of mobile payment security declines abruptly. Once you’ve engaged the early adopters, they’re able to vouch for your product’s security. Word of mouth is a dated form of marketing, but in many cases, the most powerful. Only 36% of merchants currently accept digital payments, according to Forrester. In the same way that a consumer would hesitate to apply for a credit card that’s only accepted at a fraction of the retailers they frequent, that consumer is less likely to begin using a digital wallet if it’s not widely accepted. Consistency and reinforcement will change behavior. Consider this a golden opportunity to get ahead before you fall behind. While digital wallet use is low, it’s growing. Mobile wallets are currently in the early adopter stage, and you can expect exponential growth when early adopters become the early majority. 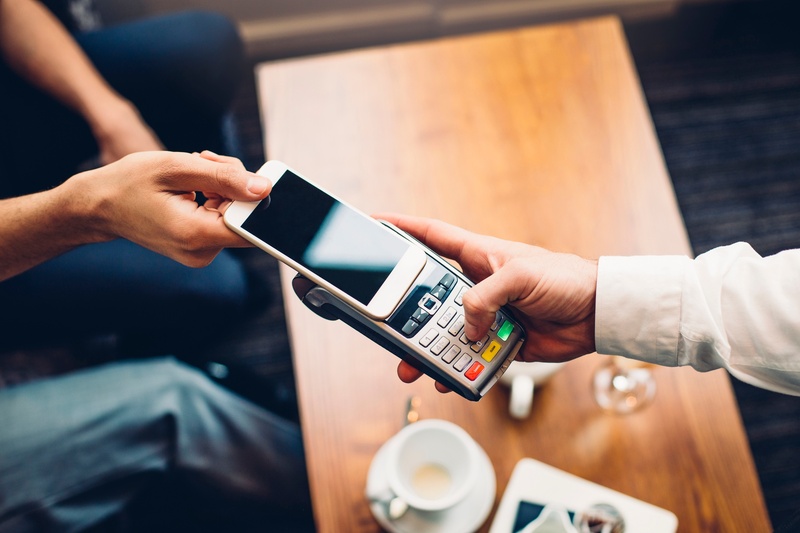 According to Forrester, 32% of consumers cite “more acceptance locations” among the top two things that would increase their use of digital wallets the most. Enable digital wallets at your location to be prepared for mass adoption. Your business will reap the benefits when your competitors lag behind. Get started by enabling digital wallet payments now. The proactive measures will pay off at the point of mass adoption. Consumers aren’t going to change their payment behavior on their own. It’s up to merchants to educate consumers and communicate the benefits of mobile wallets to encourage use. Doing so will bring consumers one step closer to the tipping point.